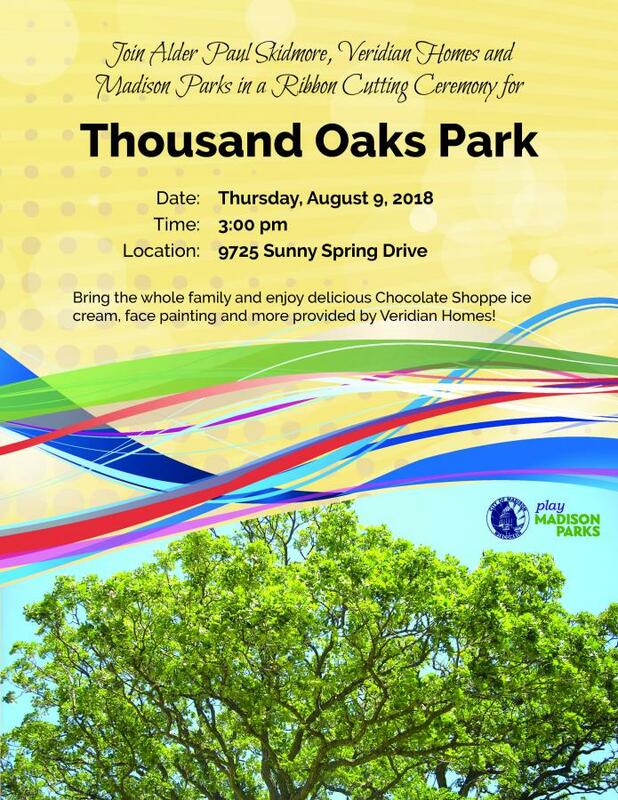 Join Alder Paul Skidmore, Veridian Homes and Madison Parks in a Ribbon Cutting Ceremony for the all-new Thousand Oaks Park! Bring the whole family and enjoy delicious Chocolate Shoppe ice cream, face painting and more provided by Veridian Homes! The development and construction of Thousand Oaks Park is a joint partnership with Veridian Homes and Madison Parks using park impact fees from the 1000 Oaks Neighborhood development. As part of the new subdivision, this 15-acre park features an open field for both passive and active recreation, a reservable 20’ x 32’ shelter, walking paths, council ring seating area and a play area with amenities perfect for children. The natural elements in the play area include a split log balance beam, plus a “rock” climber, a ZipKrooz® two-way zip line and a playground with swings.